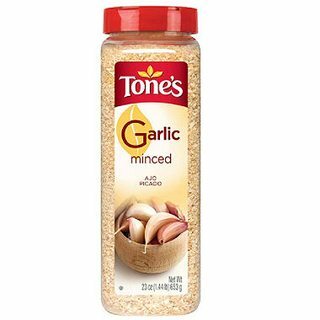 How can I prepare dried minced garlic? My question is can I mince fresh garlic, then allow it to dry on a plate and add it to the container? Or is there a special way of preparing this for reasons of taste or safety (molds, bacteria, etc)? You probably do not want to simply dry it on a plate, as it may mold or spoil prior to drying. When I checked the National Center for Home Food Preservation, I was unable to find any information on drying garlic. I was also unable to find a single University Extension that provided instructions on safe methods for drying garlic. If you google homemade dried garlic, you will find multiple recipes and methods, although powdering is more common than mincing. None of these recipes or methods come from the most reputable sources, so use them at your own risk. I find that garlic, left whole and kept out of the refrigerator, keeps for months. I keep mine in a cookie tin once it is dry. Mince it when you need it, and use the freshly minced garlic in the same way you're using the dry. Don't try to dry minced garlic yourself. There's no benefit for you, and plenty of risk. Instructions for oil-preserved garlic go on and on about botulism, which can be in anything that had ground contact, and which we cannot detect by smell or sight, unlike mould or other forms of spoiling. Risking that just so you can do all the mincing at once instead of as you need the garlic does not seem like a good idea.